Egg, beaten --- 1 ea. Butter, melted --- 3 Tbsp. Dry yeast --- 1 Tbsp. Injection needle --- 1 ea. In a standard mixer with a paddle, combine bread flour, milk, granulated sugar, water, egg, butter, dry yeast and salt. Work until dough is formed. Allow to rest 30 minutes. Roll out dough to 1/2 inch thick; cut into 24 equal portions. Preheat a deep fryer to 350°F. Fry dough until golden brown. Remove from fryer and sprinkle doughnuts with superfine sugar. 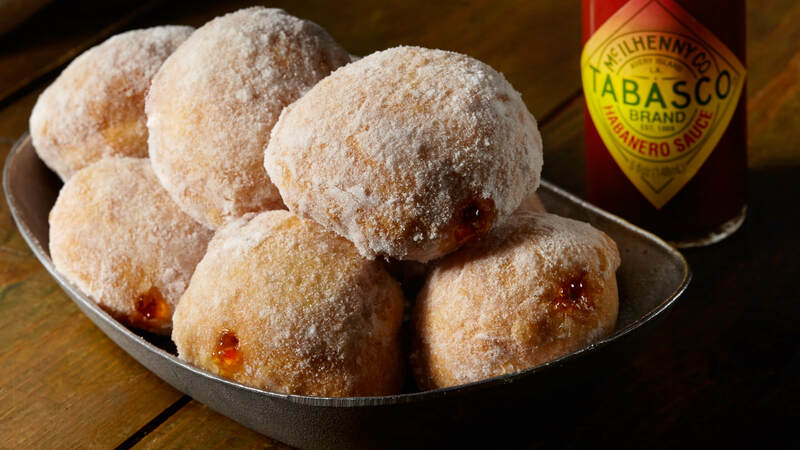 In a small bowl, mix TABASCO® Habanero Sauce into TABASCO® Pepper Jelly. When doughnuts are cool, place jelly mixture into injection needle; pipe jelly into centers of doughnuts.